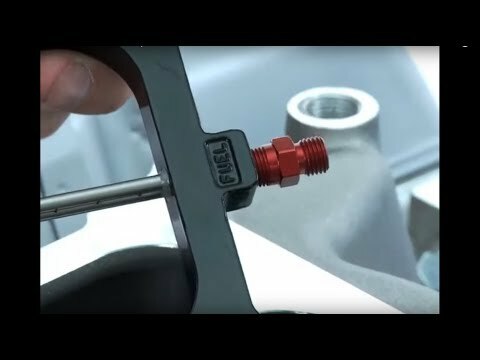 To supply the proper amount of fuel to the carburetor and the Big Shot System, a fuel pump must be used that is designed to operate between 4.5 and 7 psi, with a flow rate of 0.1 gallons per horsepower at 6 psi. For example, an engine that produces 350 horsepower when the Big Shot System is activated will require a fuel pump that flows at least 35 gallons per hour at 6 psi. 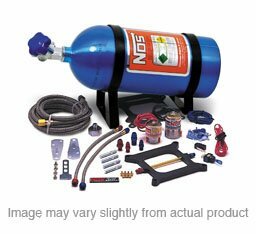 The NOS Big Shot systems use a special "fogging" plate design that vastly improves nitrous flow, fuel atomization and mixture distribution. This Big Shot plate utilizes a unique spray bar that is equipped with tiny orifices. These are precisely located to efficiently dispense a powerful nitrous/gasoline mixture for unbelievable horsepower. Power output is adjustable from 190-300 horsepower simply by changing fuel and nitrous jets. Single stage Big Shot systems incorporate a NOS Pro Shot nitrous solenoid with -6 AN nitrous supply line. Systems include a variety of power jets , nitrous bottle, 1/2" fogging plate, filters, fuel and nitrous fittings, switches and all electrical and other hardware necessary for installation. Big Shot fogging plates are available separately.